After talking with Johnny he decided to shoot three episodes! 2015 is the summer to explore Mission, B.C.! Johnny Racine and the crew at Canadian Gears released the full 40 minute interview with Jeff. 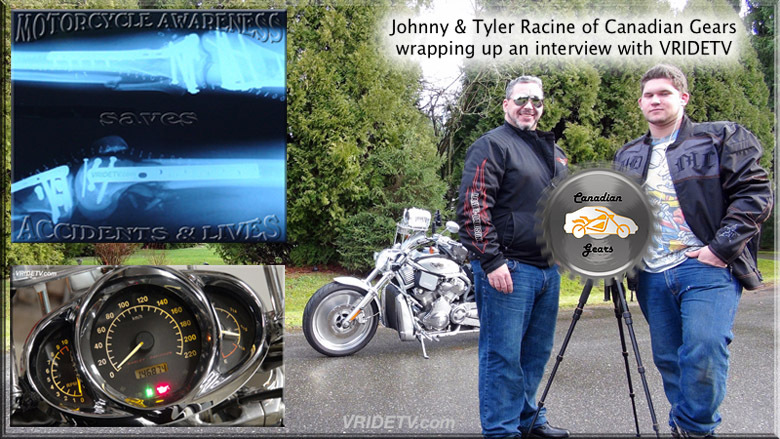 "Jeff walks us through his life changing motorcycle accident and how it lead to him to start Vridetv.com. His 2003 Harley-Davidson Vrod has been across Canada and racked up over 150,000KM's and nothing but regular scheduled maintenance was done. A true testament to the quality, reliability and durability of this motorcycle. Thank you to Elizabeth & Jim for having me on Adventure Riding Radio with Kim Lane from inReach Canada.